The miserly pricing of the VC15 means that we can all now make the kind of noises our heads hear but which are rarely, if ever, served up at this price level. With the VC15 Laney has excelled in providing guitarists with professional tones and facilities at a practice-amp price. Today's little Laney, the 1 x 10-inch VC15 combo, reflects the organic times in which we live. As Laney's Steve Yelding puts it: "The ethos behind the amp is to let people re-discover the purity and natural tonality of valves being driven hard at a level which comfortable and can actually be used. Although vintage in attitude and packed with warmth and tone, the VC15 provides enough gain for contemporary playing and has a spiteful side as well. The sweet response of the valve power stage makes it a joy to play in any mode." Looking generally very British and specifically very Laney, with black basket-weave vinyl covering and the black and grey speaker grille piped in white, the VC15 has a rugged leather handle and steel corners all round, creating a purposeful, no-nonsense impression. This impression extends to a control layout that's simple, logical and intuitive - just as guitar amplifiers should be. Both this and the valves' cooling vent are finished in chrome, adding a touch of visual class and instant desirability. It's a real cutie, and we especially love those mini chicken-head knobs. Running in class A/B mode, the VC is powered by three 12AX7 preamp valves and a pair of EL84s in the output stage. The valves are secured in their bases on the underside of the amp's chassis, the output pair having the added benefit of spring retainers. The amp's exceptional price dictates that it's not point-to-point hand-wired, but nonetheless Laney has gone to great lengths to ensure tidy and solid construction inside and out. A kick-proof metal cage protects those precious bottles and, even though the little Laney is unlikely to find itself in too many dangerous situations, it's reassuring to know they're being looked after. The 10-inch Jensen driver fitted to the VC15 has a great reputation for delivering the sonic goods: many people in the know reckon it's the world's best 10-inch guitar speaker. Originally Jensen was one of the most important suppliers to Fender in the company's golden amplifier days. Although a single channel affair, the VC15 has two sides to its nature. The clean side has a volume control and bright switch, but press the 'drive' button (or the optional footswitch) and you enter drive mode, with its own volume and drive level pots. A traditional three-band EQ set up serves both clean and drive modes, while an onboard spring reverb brings welcome ambience and flavour to what might otherwise be a rather dry experience. Lastly, there's the tone control. "It's situated within the power stage of the amplifier," explains Laney's Simon Fraser-Clark. "Unlike a presence control which generally works around the whole of the output stage, it creates a local area feedback network. This gives a more natural high frequency cut without changing the way the power valves react when pushed into clipping. It works well at removing unwanted edge and brilliance on overdriven sounds, especially with bright speakers. It allows the overall sound to be rounded off without losing the dynamics." With bright and normal inputs plus a simple on-off rocker switch and red status light, the front panel is complete. Around the back the VC15 is no less well-equipped. As well as the eminently sensible extension speaker socket, there's also an effects loop and the socket for the aforementioned footswitch. This also governs reverb and should really be included, even if it pushes the price up a little. Laney's choice of Jensen for the VC15's 10-inch speaker has created the perfect pairing. Although diminutive compared to Cornford's Harlequin and Carrera, the amp's cabinet is wide enough to breathe and to avoid that nasal 'boxiness' that so often afflicts combos of this type. Laney is quick to point out that the VC15 is no metal monster and that it excels at anything from clean jazz to fruity blues and raunchy rock (just whack your distortion pedal in front of it should you require such mayhem). And in that sense the amp does exactly what it says on the tin. Starting off clean, there's a surprising amount of headroom on offer, so spanky country leads and funky licks are well served - especially with the bright switch engaged. But there's always the feeling that if you hit the strings a little harder the tone would break up in a really musical fashion. And of course, that's exactly what happens. Play an open A chord gently and there's a Beatles sort of quality - think Ticket To Ride - but dig in harder, especially with the clean volume cranked up, and that same A chord becomes Won't Get Fooled Again by The Who. It's a great sound for blues too, and surprisingly big: you could certainly get away with it in band rehearsals and even at a small pub gig, especially if you took advantage of the various extension cabinets on offer. 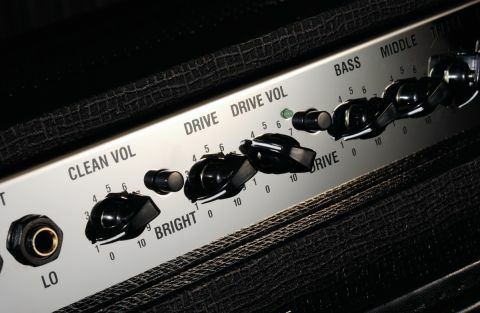 Hit the 'drive' button and we enter classic rock territory. Whether using single-coils or humbucking pickups the guitar's voice always sings clearly, never obscured by too much mush. Of course it's nice to balance clean and lead sounds, and this is where the optional footswitch would come in handy - unless you're the kind of player who likes to run everything from the guitar, that is, in which case it's good to know the VC15 cleans up beautifully with the instrument's volume backed off. In fact, you can take it all the way down to two or three for squeaky clean, up to about six for crunchy riffs and then flat out for searing leads. At full throttle we're talking Cream and Van Halen, not Slayer and Metallica, so if you need more, remember that stompbox and even these excesses can be attained.